The Sheraton Pattaya Resort and the Bangkok Fine Wine Company combined to present the Best’s Top Chef Wine Dinner in the Papaya Fine Dining area. Around 80 guests enjoyed the reception held in the Latitude room, a relaxed affair complete with oysters natural and a refreshing sparkler. It was also a chance to become acquainted with Jonathon Glonek, the MD of Bangkok Fine Wines, Jonathan Mogg, the GM of Sales and Marketing for the Australian Best’s Great Western wine company, Sheraton executive chef Spencer Kells and the always smiling Sheraton GM Michael Delargy and his effervescent wife Caryn. Jonathan Mogg, the GM of Sales and Marketing for the Australian Best’s Great Western wine company, addresses the gathering. This dinner again showed the Sheraton style, which has evolved over the past couple of years. Imaginative décor with carnations suspended from “vines” above the tables and the service ladies in a range of stunning haute couture dresses. 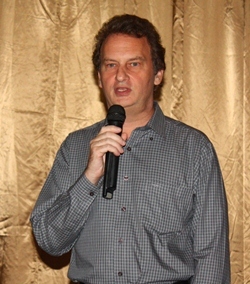 After being seated, the diners were addressed by Jonathon Glonek (who then referred to himself as “Jonathon 1”) whose company has been importing Best’s wines since 1995. He described the wines as being made using the “classical approach” to maintain the style of the wines. He was then followed by “Jonathan 2” (Jonathan Mogg), a typical laid back Aussie who informed the diners that Best’s was actually the second oldest wine company in Australia (150th anniversary coming up in 2016) and was still a family company. Founded by the Best family, it was sold to the Thomson family in 1920 and the fifth generation of the Thomsons is running the winery today. He advised that the micro-climate of the Great Western region was very continental, lending much to the style of their wines. With prior knowledge of the wines we would have that evening, chef Spencer had gone to much trouble to marry the food and wines for each course, and the first was a poached rock lobster, scallop ravioli and duck liver, washed down by the Best’s Chardonnay 2011. Very little oak was evident, and this wine had a wonderful long finish. A fine example of the current genre in Chardonnay. 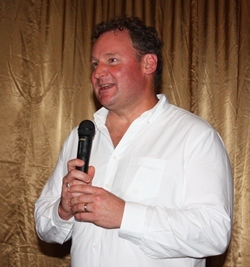 Jonathon Glonek, the MD of Bangkok Fine Wines, describes his wines as being made using the “classical approach” to maintain the style of the wines. The second course of a warm partridge tart with rocket salad and a wild garlic dressing had two wines with it, and Jonathan 2 encouraged the diners to compare two vintages of the same Pinot Noir grapes, the 2008 and the 2011. The words ‘chalk and cheese’ came immediately to mind. The 2011 was a very light wine, quite delicate and not much of a finish, whilst the 2008 was heavy bodied and had a good long finish as well. A straw poll showed that the 2008 was by far the more popular, but there was still a significant percentage of diners who preferred the 2011. As I have always said, wine appreciation is a very personal aspect to imbibing. The third course featured a medallion of veal, braised oxtail, creamed celeriac, red wine and morel mushrooms. This course I really did enjoy and the Best’s Cabernet Sauvignon 2010 went with this beautifully. The following course was another surprising taste sensation with cheese on toast ice cream with strawberry and tomato jam (how does Spencer dream these up?) taken with Best’s ‘Bin O’ Shiraz 2010, smooth and superb in all ways. The dessert course was another sensational effort with a dome of chocolate containing a dark cherry mousse which was revealed when the service personnel poured warm red wine cherry sauce all over it. The gentleman sitting next to me spontaneously saying, “That’s the best tasting dessert I’ve ever had!” Bravo Spencer! “Jonathon 1” indicated that the price of the ‘Bin O’ Shiraz 2010 was around B. 2,600 and had won the famous Australian wine award of the Jimmy Watson Trophy this year. For me, the other outstanding wine had been the Cabernet Sauvignon 2010, which is priced around B. 1,200. That made it the ‘bargain’ of the evening. Well worthwhile looking for this wine. 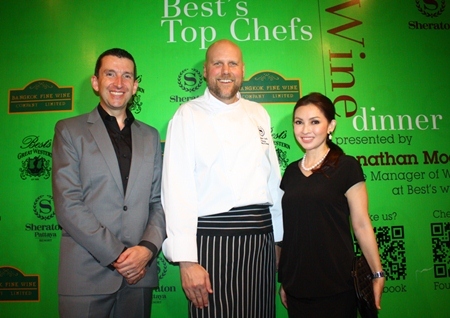 It had been a splendid evening at the Sheraton and chef Spencer Kells impressed everyone with his inventive cuisine. We look forward to the next Sheraton wine “event”! Sheraton Pattaya Resort, 437 Pratamnak Road, Pattaya, telephone 038 259 888, fax 038 259 899. Secure valet parking (and buggies to get you up and down to the restaurant). (L to R) Sheraton Pattaya General Manager Michael Delargy and Executive Chef Spencer Kells pose for a photo with Pimolwan Hunthongkam. Suwanthep Malhotra, deputy managing director of the Pattaya Mail Media Group (left) chats with the Hunthongkam family. The attentive service girl pours warm red wine cherry sauce over the dessert of a dome of chocolate containing a dark cherry mousse. Previous articleTime to Sell the Cat?